A new study by researchers from Drexel University College of Medicine reverses the popular scientific dogma that the protein tau stabilizes microtubules within brain cells. The scientists' new research, published this week in Current Biology, suggests just the opposite: Tau's actual role in the neuron is to allow microtubules to grow and remain dynamic. "We think the reason why the brain has so much tau is to ensure that there is always a robust dynamic component to the microtubules," Qiang said. "Otherwise, without tau, too much of the microtubule mass of the brain would be stable." This new discovery suggests that microtubule-stabilizing drugs currently in clinical trials may not be effective in treating Alzheimer's and other tau-based neurodegenerative diseases, said Peter Baas, PhD, a professor in the Department of Neurobiology and Anatomy at Drexel College of Medicine and the study's principal investigator. "The popular theory suggests that patients with neurodegenerative diseases are losing microtubules because they are becoming less stable. What our study suggests is that, with the depletion of tau, patients are in fact losing the dynamic regions of microtubule," said Baas. "So, by treating neurodegenerative diseases with microtubule-stabilizing drugs, the potential exists for making matters worse rather than better." Drugs that affect microtubule stability are currently under investigation as potential therapies for Alzheimer's, because it is nearly universally accepted by the scientific community – evidenced by documentation in hundreds of research papers, websites and instructional materials – that the role of tau is to stabilize microtubules in neurons of the brain, specifically in nerve fibers called axons. "We found that tau does not stabilize the neuron's microtubules. 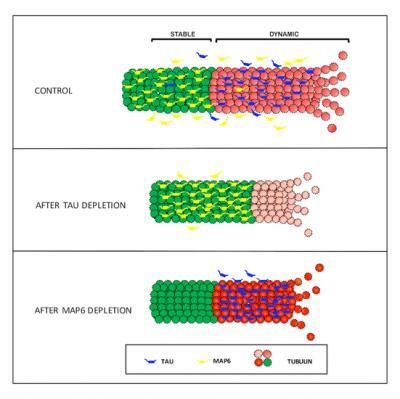 The real work of tau is to protect the dynamic regions of microtubules from being stabilized and also to allow them to lengthen," said Baas. In other words, rather than thinking about tau as a railroad tie – needed at regular intervals to stabilize a track – the protein acts more like a bridge pier, allowing microtubules to remain constantly in motion. Otherwise, the bridge would crack.